Does your meal prep need a makeover, too? Welcome to my next installment of Rest and Refreshment for Moms. Yesterday I talked about making over your morning…and today I’m tackling something we all do, or at least are responsible for, day after day… Here’s a hint: are you familiar with that daily query from the kids: what’s for dinner? But anyway, I discovered ~ at a most inopportune occasion which I’ll save for another story ~ that my beloved crockpot/slow cooker bit the dust recently. While I was pretty annoyed at the timing, I wasn’t really surprised. That baby surely didn’t owe me a thing. It’s logged in more hours than I care to count over the year or so I’ve had it. Yeah, I go through slow cookers like nobody’s business! Well, I read a recent post that was shared here on Coffee and Conversation about the Instant Pot, which got me quite curious. Are you familiar with it? It’s a new twist on the old-fashioned pressure cooker your mom and grandma may have used back in the day. Now I have to admit that the only experience I have with pressure cookers is a memory of the time my best friend’s mom tried cooking some kind of meat in one of them. I don’t recall what kind of meat it was, but, frankly, that’s irrelevant to this story. Because the only thing I remember is the brownish spray that was all. over. the. kitchen. from the thing exploding! I think you were supposed to be very watchful of your timing of the process, and my friend’s mom apparently was not. Needless to say (but I’ll say it anyway) that spooked ME out of ever using one in my own kitchen. 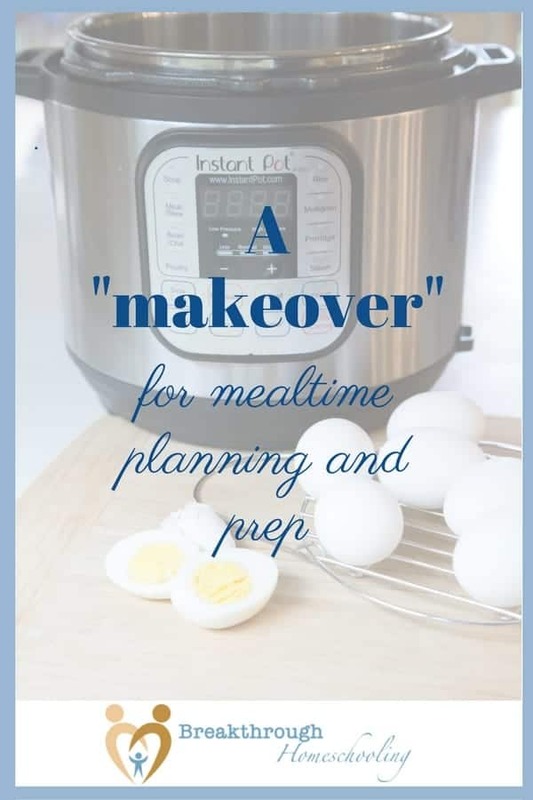 But in a newsletter I received a while back from Erin Chase of Grocery Budget Makeover and FreezEasy fame, I discovered that she’s offering a class on how to use this new-and-improved version of the old-school appliance. It’s got programming for bone broth, which I’ve been reading about lately and definitely wanting to try – the health benefits are supposed to be fabulous! A friend of mine made a batch recently and the biggest problem, as I understand it, is that it took forever on the stove… Not so with this puppy! It’s also got a setting for cheesecake, which is one of my family’s favorite desserts, but not one I make often because of the time demands. And a setting to make your own no-fail homemade yogurt! How yummy is that?! Today’s versions come with multiple safety features (10 separate ones in the model I ordered), so I don’t have to worry about a meat-spattered ceiling or walls. It also comes with saute, slow cooker, and keep warm settings, just like my old crock pot. On top of that, she teaches how to cook groups of foods together (help with meal planning – yeah! ), and suggests the first 10 meals to make (to increase your confidence level and avoid wasting time and money by cooking things incorrectly in the beginning). Included is a 2-week meal plan with a shopping list to make getting started easy-peasy. The beauty of the Instant Pot is that it is a quick cooker! So on those days when I’ve forgotten to take something out of the freezer, or even worse, have to run out to the store because I don’t have anything even planned, (does that ever happen to you? ), I can go out and buy something healthy and good for my family, and still get it prepared and served at a decent hour. Don’t worry about having to clean up a project the kids are working on so you can start supper. Don’t worry about getting home from soccer practice right away so you can start supper. Don’t worry about cutting short a playdate or time out at the park so you can start supper. Enjoy the present and enjoy supper together! My goal, of course, is to plan healthy meals for my family that we can enjoy together. The cherry on top is finding a way I can do that which also minimizes my stress. The Instant Pot is another tool at my disposal to do just that. And deciding to learn how to use it (correctly) is a no-brainer. I mean, if isn’t worth a hill of beans if I don’t know how to make the most of it, right?! To begin exploring the many uses of your Instant Pot, and discover the fun of today’s electric pressure cooking, take a look at what’s in the course! Simply click on the image and read all about it! Link up family-friendly posts that support this site’s mission of encouraging, inspiring & informing moms. Please feel welcome to contribute up to 3 posts! …and then visit at least 2 other links. That’s what makes this a par-tay! Plus, it’s kinda the polite thing to do. Linking up gives me permission to use and share your photos and blog posts (giving credit to you, of course!). Share posts with good quality, pinnable images – I love sharing our posts on Pinterest! #breakthrulinkup 32 - Build YOUR (homeschool) Bundle! I am so excited to share our first video today! It shows how to make our Hot Cocoa Bombs. Thanks for hosting and giving me a chance to share! I hope you will check it out. Also, I used to be afraid of pressure cookers, too. Then I got one for canning and now I love it! What a “sweet” video! 😉 Those look aMAzing!! What kind of pressure cooker do you have? I can’t wait to get started on my Instant Pot – it’s the next best thing to magically coming up with a supper solution. Thanks for the linkup Today. Happy Wednesday and blessings to you! Thank you, Michele 🙂 You, too! And happy Wednesday to you, too! Glad to “see” you here – have a great week!! I love my instant pot – my mom just got me one and they’re so awesome! I can’t WAIT to get mine!!! My pleasure, Robin! 🙂 Hope yours is the same! I have been wanting to get an instant pot but not willing to give up my stand by crockpot yet. I am still debating. Your post has really got me thinking I should make the move. Oh, Sandy, I don’t think you need to choose one – they can both be wonderful helps in the kitchen! The slow cooker is for when you actually HAVE something planned for that day – LOL! I am so in love with my Instant Pot too! Aren’t they fantastic? You can do just about anything with them. Thanks for hosting the party!! Be sure and drop by the Family Joy Blog Link Party next week, we’d love to have you! Have a great day…and hope to see you again next week! You have really piqued my interest in using an Instant Pot. Having an easy to use item that makes broth, yogurt, soups, stews and even cheesecake would be very helpful. Thanks for hosting this fun and fabulous party!